Grounded in theoretical principle, Media Effects and Society help students make the connection between mass media and the impact it has on society as a whole. The text also explores how the relationship individuals have with media is created, therefore helping them alleviate its harmful effects and enhance the positive ones. The range of media effects addressed herein includes news diffusion, learning from the mass media, socialization of children and adolescents, influences on public opinion and voting, and violent and sexually explicit media content. The text examines relevant research done in these areas and discusses it in a thorough and accessible manner. 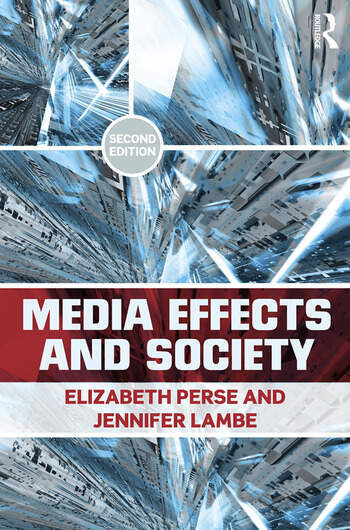 It also presents a variety of theoretical approaches to understanding media effects, including psychological and content-based theories. In addition, it demonstrates how theories can guide future research into the effects of newer mass communication technologies. The second edition includes a new chapter on effects of entertainment, as well as text boxes with examples for each chapter, discussion of new technology effects integrated throughout the chapters, expanded pedagogy, and updates to the theory and research in the text. These features enhance the already in-depth analysis Media Effects and Society provides. Elizabeth M. Perse (Ph.D., Kent State University, 1987) is Professor and Chair of the Department of Communication at the University of Delaware, Newark. She is currently researching and teaching mass communication theory and the uses of newer communication technologies. She has been identified as a prolific researcher in Communication, having published one scholarly book, two textbooks, and more than 50 journal articles and book chapters. Her research has been published in such journals as Journal of Broadcasting & Electronic Media, Communication Research, Journal of Communication, Human Communication Research, Communication Quarterly, Communication Research Reports, Journalism Quarterly, and Health Communication. She serves on several editorial boards and is a past Chair of the Mass Communication Division of NCA. Jennifer L. Lambe (Ph.D., University of Minnesota, 2000) is an associate professor in the Communication Department, and a senior fellow of the Center for Political Communication at the University of Delaware. Her research focuses on media policy, freedom of expression, audience attitudes about censorship and the role of audience perceptions of media effects in shaping those attitudes. She has published more than 20 journal articles and book chapters, as well as a number of encyclopedia entries and book reviews. Her work on censorship attitude measurement has been recognized by both academics and practitioners, and reprinted in a communication measures sourcebook. Her research has been published in such journals as Journal of Communication, Communication Law & Policy, First Amendment Studies, Journalism & Mass Communication Quarterly, Journal of Broadcasting & Electronic Media, and Mass Communication & Society. Professor Lambe teaches courses on media law and ethics, media effects, children and media, and media theory.